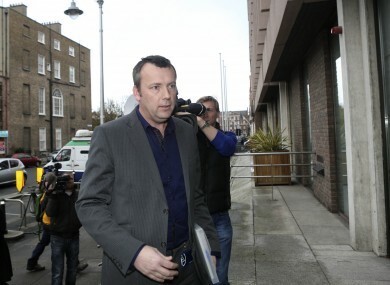 Brendan Ogle after speaking to the media outside the ESB headquarters in December. THE SECRETARY OF the ESB Group of Unions has announced that he will be stepping down from his position in the coming days. Brendan Ogle said this afternoon that he will no longer be representing workers in the ESB and had taken the decision with the support of the unions. Ogle will also be leaving his position within ESB with the company saying the decions was by mutual agreement. Ogle was the secretary during the recent dispute between the ESB GoU and the company over the pension scheme at the semi-state company. The dispute had threatened to lead to power cuts over the Christmas period but was averted after trade unions and management reached agreement. Ogle said today that the successful conclusion of this dispute was the primary reason for him opting to leave he ESB GoU. “I have been representing ESB workers for 10 years and, in that context, the recent successful campaign to have the ESB pension scheme properly reclassified and treated as a Defined Benefit pension scheme allows me to do so at an appropriate time, ” he said. It is ironic, but not surprising, that in recent weeks the very ESB workers who had been viciously attacked by some in the media for having the temerity to protect their pension rights, have demonstrated the very best of public service as they have battled extreme weather to protect electricity customers safety and supply. By their actions, in such dangerous circumstances over the past two months, they have silently answered the unwarranted attacks of their critics. While 2013 was a difficult period for Industrial Relations in ESB and in turn for customers, ESB acknowledges that over the period of his involvement with ESB as a union official and as secretary of the ESB Group of Unions, Mr Ogle made a significant contribution, particularly through the delivery and implementation of a number of important change agreements. Email “ESB union chief quits but takes aim at the media on his way out”. Feedback on “ESB union chief quits but takes aim at the media on his way out”.